Purchase order billing program is economical solution helps business user to store transaction in easy to use computerized format. Purchase ordering utility capable to generate reports like quote, delivery order, vendor payment, invoice, deposit etc. 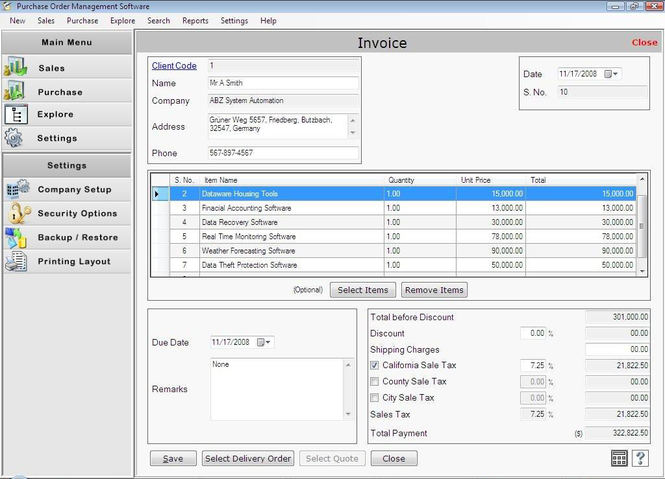 Sales order recording utility offers invoicing department to enter all customers, vendor and items information using keyboard instead of using pen and paper. PO management application is useful for all small and big organization to maintain entire company transaction reports with exact date and time. Purchase order management software facilitates Windows user to create, process and track various sales or purchase transactions details. PO management program allows user to auto generate purchase order reports, eliminate duplicate data entry and automatically update the inventory details. Password protected invoicing utility allows only primary users to perform changes in software configuration setting and protect users secret financial transaction reports from unauthorized users. PO management software has user friendly GUI interface that allows various type users to understand software working easily without any technical experience. Order management software provides comprehensive business management solution to process, maintain and keep track of entire purchase, sales and inventory tracking activities. PO management software easily creates various sales/purchase reports including quote, delivery, purchase order, vendor payment, receipt etc and saves all at user desire secure PC location. Easy to follow data entry application provides facility to generate purchase orders having accounts payable, cash, credit, debit, credit cards, as well as customized payment options available. Software features: * Purchase order billing software facilitates to track purchase and sale order number and payment details in easiest way. * Purchase order organizing tool replaces manual documentation in computerized format that can be easily modified by user. * Easy to use PO management software streamlines and organizes the entire purchasing process of the business organizations. * Sales order organizer is password protected utility with advance data backup and restore policy.